The idea behind embarking on this journey around the world had always been that the world is full opportunity. To find it though, we must be completely open to it. I don’t mean searching through a job site. I mean doing what you are passionate about. For April and I, it is travelling, writing, filming, learning and experiencing local culture. Since our arrival in Antigua, Guatemala we have found so much support for our work featuring local places, people and events. We’ve already had our articles shared on huge social media platforms, been on television and networked with amazing people who respect and admire our choice to put our faith in the universe. Most recently, April and I were invited to partake in a collaborative project creating a traditional alfombra with local school children from Escuela Luis Mena. The project, a yearly tradition sponsored by George’s Travel Club, is intended to educate and encourage participation of children. It also gave us an opportunity to learn a new perspective on the activity, normally a labour of devotion, gratitude and penitence. (More on the cultural understanding of alfombras here.) We teamed up with talented videographer Alex Jones for a new channel called Antigua Cultural. The mini-documentary will feature a complete birth to death time-lapse video of this temporary work of art by the children, through the moment where the single anda Santa Ines procession carries Jesus Christ and the Virgin Mary over the alfombra offering. 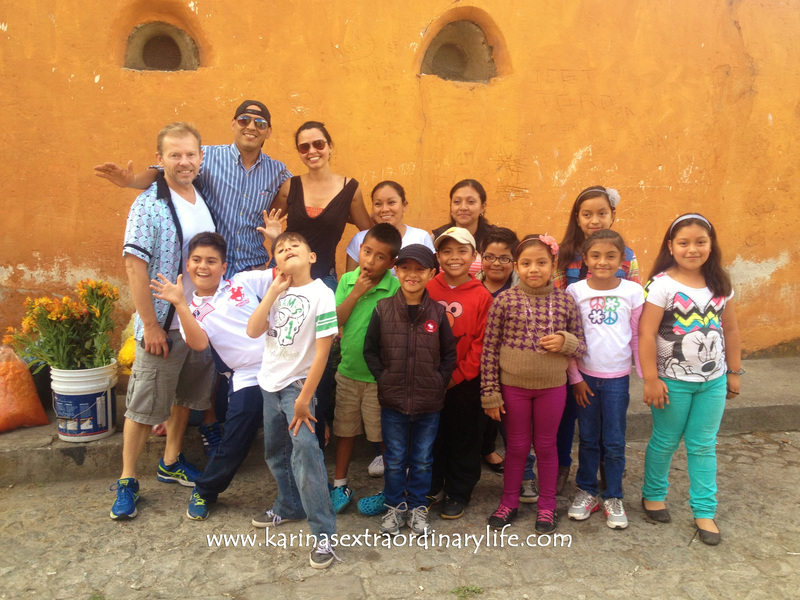 We also had the opportunity to interview the children and their teacher, Alejandro, about the meaning of their project and get first-hand insight into how their young minds attribute significance to this beautiful tradition. Children began arriving early afternoon. Initially, they shied away from us strangers. My first job was to make them feel at ease with us and with the presence of the camera. Alejandro, who had also designed the alfombra, began to guide them through the process, first cleaning the streets and then cutting the flowers from stems for the center displays. It was impressive to see the diligence by each child in fulfilling their role. The pine foundation was laid next. As the designs began to take shape, the children became more and more eager to take their place in front of the camera and share their excitement. It became clear to us early on that the children considered this a fun activity. They saw this as an opportunity to play with their classmates and bond with friends. Few children spoke of the sacrifice involved unlike their parents, whose beliefs are rooted spiritual significance and religious fervor. Those who understood the teachings of the Bible were eager to explain to us how this is just a wonderful way to be thankful to Jesus for HIS sacrifice for all of us who have sinned. One 8 year old was under the impression that God would punish those who didn’t welcome him with an alfombra! Despite the range of reasoning, nothing took away their earnest work ethic. They were proud of their collaboration and excited knowing that their example would be used to teach others about their traditions and beliefs. As for the grown up team, we are overjoyed to not only witness and report on the extraordinary events and culture of this Semana Santa, but to be involved. April and I are so grateful to all the people who have welcomed us with such warmth and excitement. We left our homes with open minds and open hearts have received us everywhere we have gone. UPDATE: It’s ready and you can watch it right here!!! 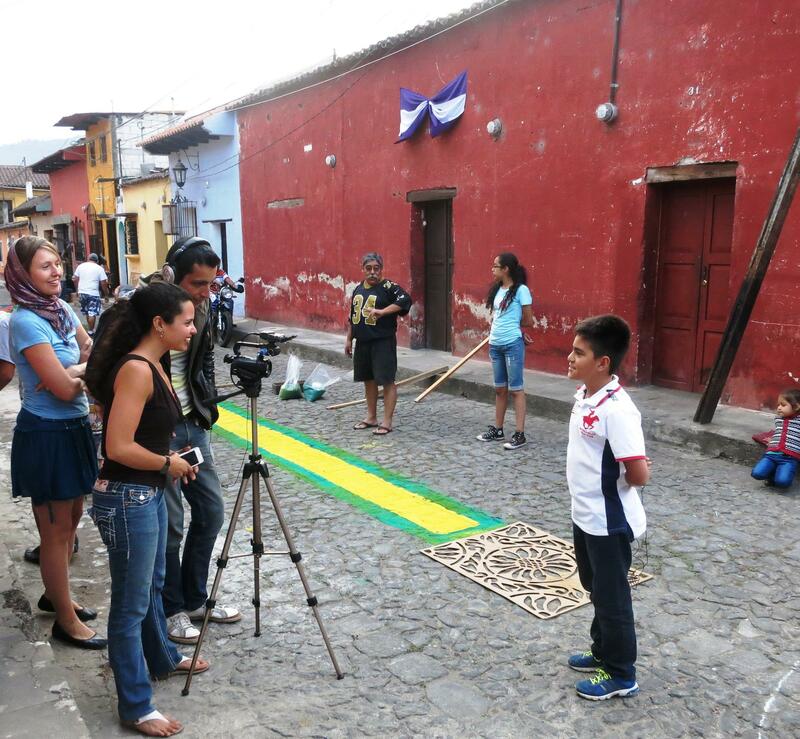 THANKS Karina N for a wonderful story about the local school children who helped build the alfombra (carpet/rug) for this past Monday’s Semana Santa procession – in front of my house – in Antigua, Guatemala! It was such a GREAT experience for everyone, and my travel agency (www.Georges-TravelClub.com) was happy & proud to be a sponsor. Thanks also to April-Joy Beresford & Alex Jones for their help in making this such a great experience for everyone!